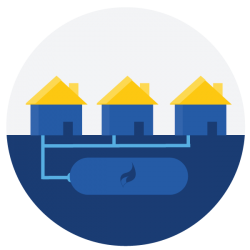 A metered estate is for rural housing developments where the houses draw their LPG gas from a shared supply through meters on each house. The LPG company maintains ownership of the shared tanks and the meters are read in order to bill each customer individually. The tanks are regularly topped up in order to maintain constant supply to homes. Switching supplier is easy, the maximum contract term is two years and a switch can be initiated by filling out a supplier switch notice. We always like to arrange a meeting with an estate spokesperson in order to ensure we can provide all customers with exactly what they need. Copyright 2016 Rectory Gas Supplies.